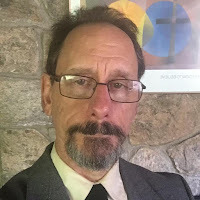 Parts 1 and 2 in this 3-part series talked about four different worldviews. The view that sees the world as our lover -- and the view that sees the world as our very self -- can provide us a grounding in joy, allowing us to respond in care to protect the Earth. Environmentalism can then be something we want to do, something that feels good – not just some duty we’re brow-beating ourselves into. With that in mind, let's turn to some facts about the waste situation. Each year Americans throw away enough edible food to solve the problem of food insecurity in the US -- and 50 million American experience food insecurity each year. Only one third of the waste in the United States is recycled or composted. Achieving zero waste would reduce the US’s greenhouse gas emissions by almost 40 percent. Is this possible? And would it feel joyful to care for the Earth and all its inhabitants, human and otherwise, by reducing waste, walking with a lighter step – just because the Earth and its inhabitants are ourselves? There are five different kinds of responses to waste. Prevention is the best – the most caring. This is avoiding generating waste products in the first place. Prevention of waste involves using less material in design and manufacture, keepings products for longer, and using less hazardous materials. Sometimes – when it feels joyful to do so – it can involve not acquiring products. The worst option, at the other end of the scale, is disposal. Dumping or incineration of waste without energy recovery are not sustainable. Landfills are the most common form of waste disposal and the final disposal option. Disposal requires considerable pre-treatment or the waste, and this also uses energy. Some estimates suggest that 50 percent of what goes into a landfill essentially never degrades. The landfill itself facilitates some biodegrading, but then reaches a point where it’s preserving what’s in there. The key paradigm shift is to think of it not as garbage but as a resource. In between prevention of waste and disposal are a range of alternatives. Reusing is good. Reusing what might otherwise become waste typically requires collection but relatively little or no processing. It involves checking, cleaning, repairing, and/or refurbishing. Making donations to -- and many of your purchases from -- places like Good Will or Salvation Army stores is a way to boost reuse. Not quite as optimal as re-using is recycling. The process requires collecting, sorting, and processing recyclable substance into raw material and then remanufacturing that raw materials into new products. Next best after reusing and recycling is energy recovery. Recovery of energy would usually be incineration that makes use of the heat. This is not great because it’s not efficient, and often generates pollution, though it’s still better than flat disposal. In particular, locally, one great thing that’s starting to happen is food scrap recycling. Our environmental practices social justice team has been doing great work. The leaders Janet Bear and Charlie McNally have educated me about this, and I’m so thankful for the wonderful attention they’ve been giving to the project of helping CUUC become an official green sanctuary. One year ago, Scarsdale began a food scrap recycling program. It’s not just for compostables but also egg shells, bones – any food scraps. No pet waste or yard waste, though. 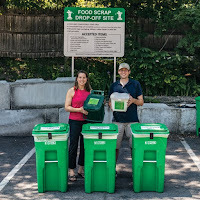 To participate in this program, if you live in Scarsdale, you collect your food scraps in a countertop pail. You’re likely to fill that pail 3-4 times a week, so it’s handy to have a larger bin to transfer the scraps to when the pail fills up. When the bin gets full, you take it down to the drop-off location: 110 Secor Road, Scarsdale, open from 8 to 3, Monday through Saturday. Cool. These food scraps will be turned into nutrients usefully returned to the Earth to help plants grow – plants that sequester carbon. Otherwise, food scraps go to either a landfill or incinerator and the resource is lost. In landfills, scraps create methane, which has about 30 times the heat-trapping power of CO2. 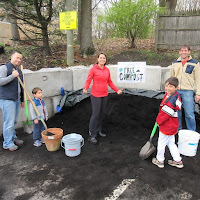 The compost that Scarsdale is creating from food scraps will also help reduce soil erosion, and lower the need for using as much water, pesticide, and fertilizer. Does that feel joyful? It's in Scarsdale, and if you’re there you can start that right away. Scarsdale’s was the first food scrap recycling program in the county, and for it they got the 2017 Westchester County Earth Day Award. 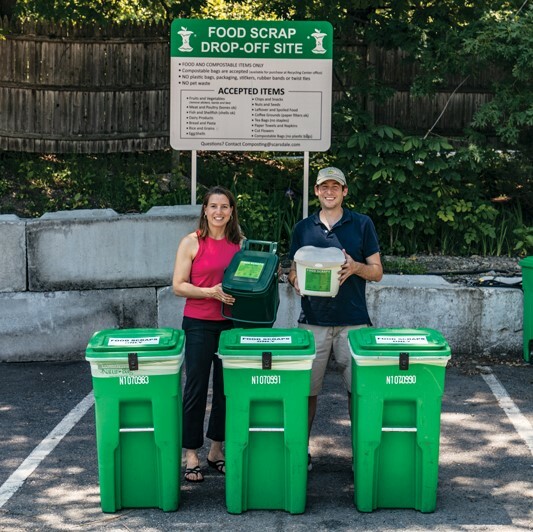 Our Green Team – which is easier to say than “Environmental Practices Social Justice Team” -- is also working on encouraging White Plains to also create food scrap recycling facility. Is that not awesome? Go team! Perhaps you are thinking, "Running my food scraps down to some center every week or so is one more chore I don’t have time to do!" I understand. I’m not asking you to do what isn’t joyful for you. But it might be joyful – and if, for you, it is – there’s a really fun, pretty simple thing you can do. Having a world-view that sees the world – the Earth and all its beings, human and otherwise – as lover, or as self – can be a key part of that joy. San Francisco has a goal of zero waste by 2020. They’ve got two more years. As of 2014, San Francisco was still sending 400,000 tons a year still going to landfill. The idea of living in a way that has zero waste just feels really good. My heart loves that, quite independent of what my head knows about the facts and science of global warming and pollution. And San Francisco is moving toward getting there. And if San Francisco does it, maybe eventually Westchester can. Zero waste. Wow. Part of what feels so good about that it’s a collective enterprise. None of us can make Westchester a zero waste county by ourselves. That’s what’s so joyful about the concept. It brings us together. And in my worldview, the healing of our world is the healing of ourselves. Part 1: "We Are Our World Knowing Itself"